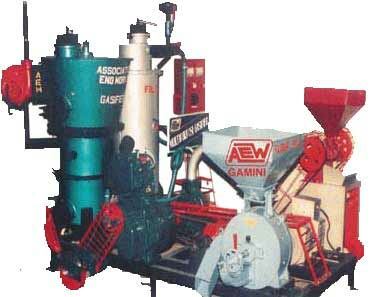 ASSOCIATED ENGINEERING WORKS is a renowned Manufacturer, Exporter, and Supplier of Multi Purpose Gasifier. In developing Countries, many tiny and remote villages have no grid power accessibility. However many of these villages are agro based and the villagers need small motive power to fulfill various tasks like Paddy de-husking, grinding of pulses/rice, wheat etc., in addition to drinking water pumping. The Multi Purpose Gasifier is designed to cater to these needs by incorporating various gadgets along with small Electric Generator (5 KVA) and a Pump to be run using the same 10 HP engine. In the evenings/nights the generator can be run to illuminate the houses for fixed hours. The locally available Biomass can be used to run the Dual Fuel Diesel Engine with reduced diesel consumption. Accepts all wood wastes in addition to Coconut Shells, Corn Cobs etc.